Yep, just like the author promised, this spaghetti pie is sorta along the lines of baked ziti but in a blissfully easy, low-fuss, use-up-your-leftovers sorta way. It’s nothing fancy, mind you. But then, it’s not supposed to be. It’s just comforting as heck. 2. If using leftover spaghetti, warm it in a saucepan or skillet over low heat or in the microwave. In a large bowl, gently mix together the spaghetti, eggs, Parmesan cheese, 1 cup mozzarella, and 3/4 cup red sauce. 3. Slick a 9-inch pie tin or glass pie plate with olive oil. Spoon the remaining 1/4 cup red sauce in the dish and gently press the pasta into it. Top with the remaining 1/2 cup mozzarella. 4. Bake the spaghetti pie in the oven for 30 to 35 minutes. Remove from the oven and let it rest at least 5 minutes before using a pizza slicer to cut it into wedges. Go ahead and toss in some fresh or dried herbs, chili flakes, or hot sauce to the red sauce prior to tossing it with the spaghetti. 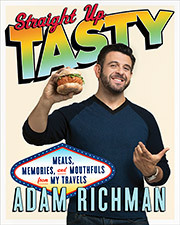 Spaghetti Pie Recipe © 2015 Adam Richman. Photo © 2015 Evan Sung. All rights reserved. All recipes and photos used with permission of the publisher. 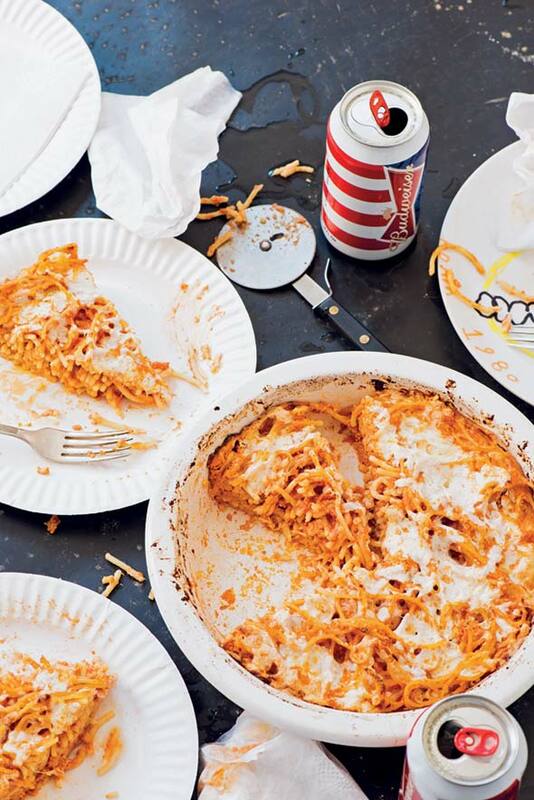 This spaghetti pie is a quick and easy classic and a great use for leftover spaghetti. What could be better for a hectic weeknight? This looked like a recipe that was designed for using what was in the pantry. Because of this, I grabbed half a jar of thick marinara sauce and combined it with the cooked spaghetti, eggs, and cheese. The prep took about 5 minutes. If you didn’t have grated cheese on hand, it would probably take a bit longer. I poured the spaghetti mixture into the pie pan that had been slicked with the olive oil. I sprinkled the cheese on top and placed it in the preheated oven. After baking for 30 minutes, the casserole was ready. I let the spaghetti pie rest for 3 minutes and then sliced it with a pizza cutter. The flavor was great, and my family had no problem devouring the entire casserole in one sitting. I used spaghetti for this dish, but I would love to try other shapes. I also think it would be fantastic with some added vegetables like zucchini or broccoli. The total time from start to finish was 40 minutes. It's like lasagna without all the hassle! It's a great way to use up leftover spaghetti! It's spaghetti pie! This recipe yields 4 servings of cheesy, gooey, yummy pasta pie! This recipe took 10 minutes hands-on time because I grated my own Parmesan cheese; otherwise it would've taken even less. The cheese on my spaghetti pie was browned and bubbly after 30 minutes of baking. I used thin spaghetti. I used the pasta sauced with the red sauce recipe from this website. I used a thick, jarred marinara as the extra red sauce, but I would love to try this again using more of the red sauce recipe (I didn't have any extra). Serve this spaghetti pie with a side salad and a glass of red wine and you have a perfect meal, full of flavor and extremely satisfying. While this recipe could easily fall into the category of comfort food, it's not a heavy dish and could be served any time of year. When I first read the recipe, I thought I would be using a half pound of spaghetti which would then be cooked. Then I realized that I needed to weigh some leftover cooked spaghetti and use only 1/2 pound of it. I used angel hair pasta which was what I had in my pantry. Be sure to let the pie rest about 10 minutes after it comes out of the oven to help it settle and be easier to cut. The pie baked perfectly in 35 minutes and only took 10 minutes of prep time, so this is a dish that can be ready to serve in just under an hour which includes the 10 minutes resting after baking. This spaghetti pie was initially underwhelming to me, but it grew on me as I saw what a huge hit it was with my normally picky 5-year-old. She requested it for both lunch and dinner the following day, which never happens! That reason alone pushed this over to make-again territory, as I feel the pain of other parents of extremely picky eaters. The recipe is easy to modify for toddler or adult taste buds and very quick to put together. I used regular spaghetti that was cooked the night before and lightly sauced. I didn't have marinara on hand so I subbed tomato sauce. In the future, I would add some basil or oregano to spice things up and definitely red pepper flakes on the adult side of the pie. I would say this provided 4 generous adult servings as a main dish. It also reheated very well.